If you’re the type of person who travels a lot you need to make sure you need the right gear. That means everything from a suitcase to a carry on garment bag. If you’re looking for the best possible carry on you need to look at our top carry on garment bag review options. We’ve created a list of some of the important features that you’re going to need to make your choice. Just take a look at each one and then take a look at the top bags that we’ve found and listed below. Wheels: Does the bag have wheels? 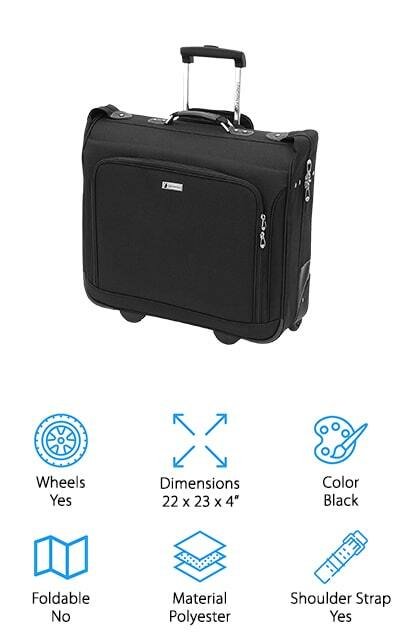 Wheels make the bag easier to move through an airport or even get by on a bus or town. Carrying a bag around can be difficult and heavy, but a bag on wheels makes it convenient. Dimensions: What size is the bag? The dimensions of the bag will dictate whether it works for you or not. After all, you need a bag large enough to carry the clothes you need but not too large where it’s uncomfortable to carry. Color: What color is the bag? This is about personal preference but it’s something to pay close attention to. You want to know if the bag comes in different colors or if it comes in the style that you want most. Foldable: Can you fold the bag down if you aren’t using it? If you can fold it that means you’ll be able to make it smaller and get it out of your way. If you can’t it takes up more space even when you don’t actually have it filled. Material: What is the bag made out of? Different materials have different strengths. Some will be more durable than others. Some are easier to clean than others. You want to make sure you have something high quality. Shoulder Strap: Is there a shoulder strap? A shoulder strap makes it easier to carry with you. If you can throw it over your shoulder you can more easily carry other bags with you. This is another personal preference. With so many different bags out there, it can be difficult to figure out just which one is best for you. Even with the different features that we’ve discussed you still can’t narrow it down very far. That’s why we’ve done some more work for you. Now we have a list of the top ten garment bags that you can use as a carry-on. That way you’ll be better prepared for that next trip, without having to do so much research on your own. If you need the best carry on garment bag for business travel then this is where you want to start because it’s our top pick. This bag is large enough to hold anything you’re going to need and what’s even better is you get 3 different options on how to carry it. Take it by the shoulder strap, handle or pull it along behind you on wheels, whatever is most convenient. It has zippered pockets to keep everything organized and secure and unfolds just like a book when you want to open it up to get your clothes out. There are hanger brackets to keep your clothes where you want them and even a lining and tie down straps. With this bag, you get a polyester exterior that’s durable and easy to clean. You also get the classic look that you expect from your suitcase and a lightweight design. It’s even made to hold shoes, accessories and more. When it comes to the best carry on garment bag for suits you may want to take a look at our budget pick too. This one is inexpensive but provides you with excellent features. First, it’s a large enough bag to hold several different outfits, including suits, dresses, and even shoes. You’ll be able to keep out the wrinkles and carry the bag with the handle or with a shoulder strap. Made of polyester for durability and ease of cleaning. There are even zipper pockets on the outside and inside to keep everything you’re going to need for that next business trip organized. If you’re uncertain there’s even a money back guarantee so you can return the bag and get your money again. You’ll also be able to fit it easily in an overhead bin when you travel by air or you can keep it thin and nearly flat to put in your vehicle for other travel. This may be the best men’s carry on garment bag you’ll find for a number of reasons. The price is moderate and the bag itself is large enough to carry several outfits and several accessories. Everything stays flat and wrinkle-free. Not only that but the bag itself is on wheels and has a handle that lets you carry it however you like. The padded straps hold everything where you want them and there are even pockets throughout to make sure everything stays organized the way you want it. Even better, you get a 1-year warranty that proves it’s going to last. When you’re ready to get everything out you can unfold the pockets and get into it easily enough. Easy to take with you and easy to stand up when you’re stopped, this is a great bag to take with you on your travels, by plane or anything else. 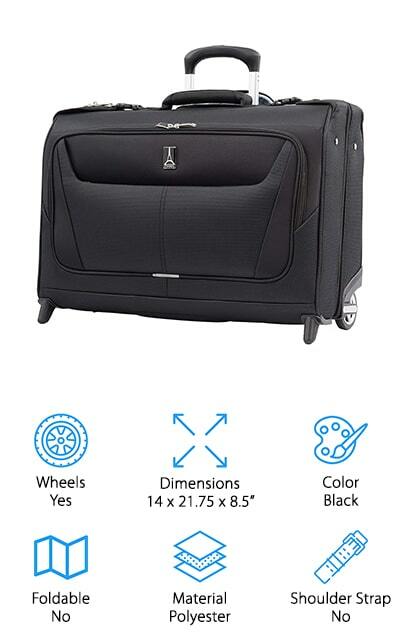 This isn’t the best carry on garment bag with wheels, but it does have a lot of great features. 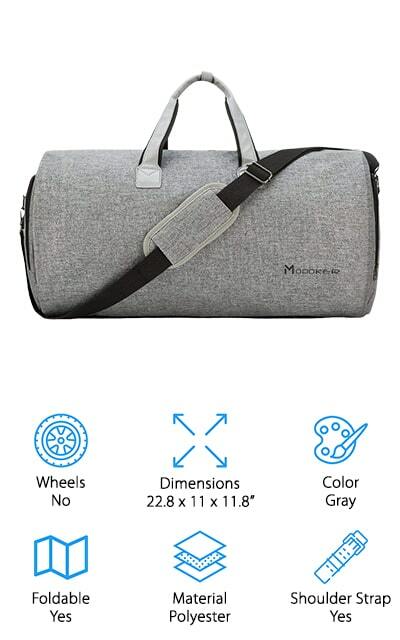 It’s a smaller bag, that’s actually similar to a duffel bag, but it’s able to hold suits and hangs to provide you with the wrinkle-free clothing you need. The sleek look of this bag is ideal for anyone who wants to always have the best of what they can. It’s a weekend style bag that won’t hold garments for a long trip, but it definitely works for short travel. It’s water resistant and made with polyester to provide durability as well as making it easier to clean as needed. Polyester also makes the bag scratch resistant and resistant to tearing and other damage over time. All you have to do is unzip it and you’ll be able to hang out all of your clothes. When zipped you can carry it with the handle or with a shoulder strap. This is one of our favorite options for anyone who needs a small bag but still wants features. It’s designed to stay nearly flat, even carrying up to 3 full suits and shirts wherever you need to go. There are pockets throughout that hold everything you may need and make sure it stays organized and there are even hooks and tie-down straps to keep everything from getting wrinkled. Whether you’re traveling for a long time or just a short while, you’ll be able to get a lot of use out of this bag. It’s lightweight, inexpensive and made with polyester for durability. When it comes to carrying this bag, you can either use the handle or the shoulder strap to make it easier for you. 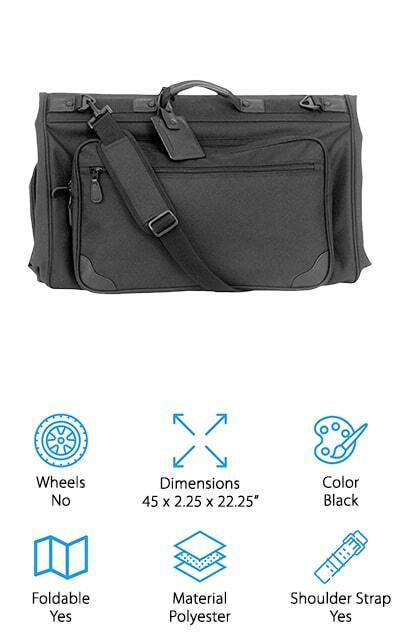 It’s not a trifold carry on garment bag with wheels but it definitely is a bag you should consider for your next trip. 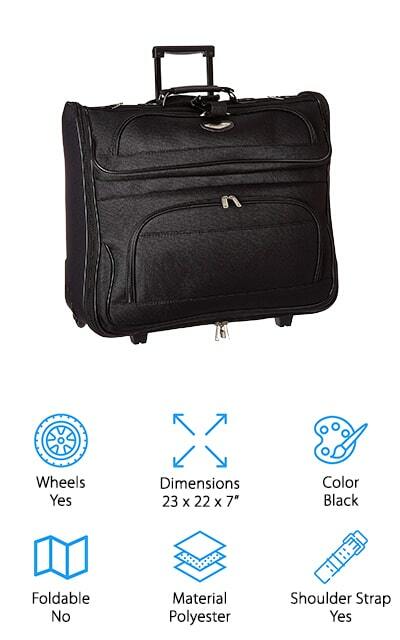 This Samsonite carry on garment bag comes in 2 different colors so you can choose your own personal style. It’s lightweight and has airflow wheels that allow you to spin it in nearly any direction. This makes it even more convenient when you’re walking through the airport or even through your hotel. There are handles on both the side and the top of the bag so it’s simple to carry and it has a hanger bracket to move your clothes directly into a closet when you arrive without having to worry about hanging them again. Made with a durable polyester, it’s lightweight and has plenty of pockets to keep more than just your suits and dresses organized. It will also hold any of the accessories that you might need for your trip or just to have some fun. Here we have a tri-fold carry on garment bag that’s designed to get you everything you need for that next trip. You’ll have a shoulder bag that also features a handle so you get to carry it the way you like. It folds down or open easily and it’s made with high quality polyester for strength. You’ll even get luggage tags included so you don’t have to find your own. 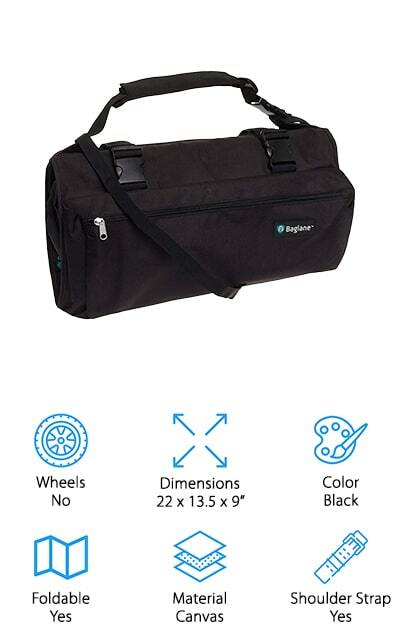 Inexpensive and moderate in size, this bag is still going to hold any of the clothes that you need it to for that next trip and it’s going to do so the way you expect. There’s even a separate pocket through the back that makes it easy to put this bag right over the handle of your regular suitcase so it’s faster to move through the airport. Just unfold it and stock it up with everything you need then fold it back up and you’re ready to go. 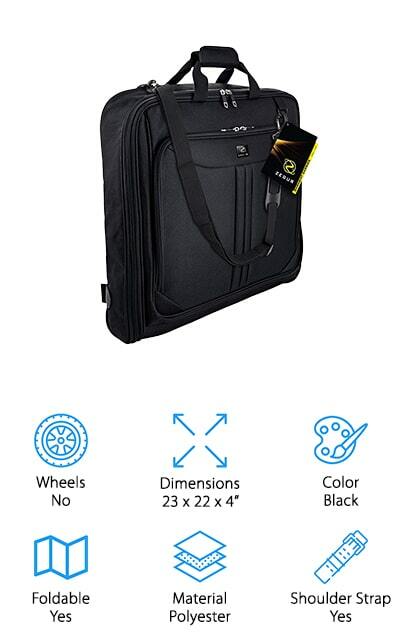 It’s not exactly a Briggs and Riley carry on garment bag, but it’s a high-quality one that gives you great looking suits, dresses, and other clothes when you arrive at your destination. All you have to do is unzip the sides and you can unroll this bag to reveal your suit, in the best possible condition, waiting for you. It’s made with a heavy canvas and comes with plastic inserts to hold shape as well as a hanger so you can hang up the bag while you’re packing and unpacking. 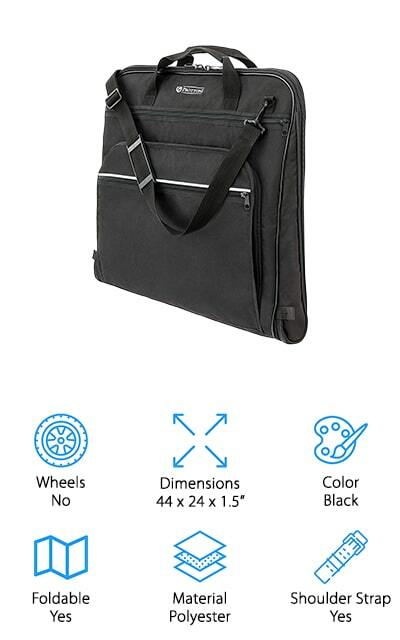 There’s plenty of space and pockets throughout the bag to hold all your accessories including shoes and even a tablet and pens. Perfectly sized as a carry-on, this bag is lightweight and easy to sling over your shoulder or across your back while you’re walking. But you still won’t have to worry about how your shirts and suits are going to look when you arrive. With this garment bag, you’re going to have a choice between 4 different colors, which means you can choose a look that’s going to match your personal style. It’s made with polyester and EVA reinforcement to make it even stronger, ready for anything. It also has corner protected wheels so you don’t have to worry about traveling through the airport. The larger compartment in the center holds your suits as well as all the accessories that you may need while you’re traveling and it looks great at the same time. When you’re ready to carry it, you can choose between wheeling it after you, a handle or shoulder strap with a pad. This bag is large enough to hold everything you’re going to need but not too large to get around easily. Not to mention it’s not too expensive for most budgets. Whether you need something for a business trip or anything else, it’s definitely going to do the job. 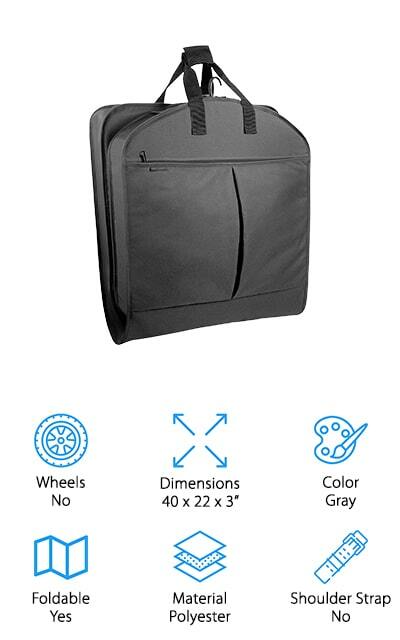 This airline carry on garment bag is actually quite simple because it’s very similar to a standard garment bag that folds in half to make it easier for you to transport. It comes in a range of different colors for your personal preference and has a hanger clamp to keep everything right where you put it. It can hold up to 6 items in the hanger clamp and it has pockets to store some of your accessories at the same time. All you have to do is clip in your hangers, zip up the bag and fold it. You’ll be ready to go just like that. 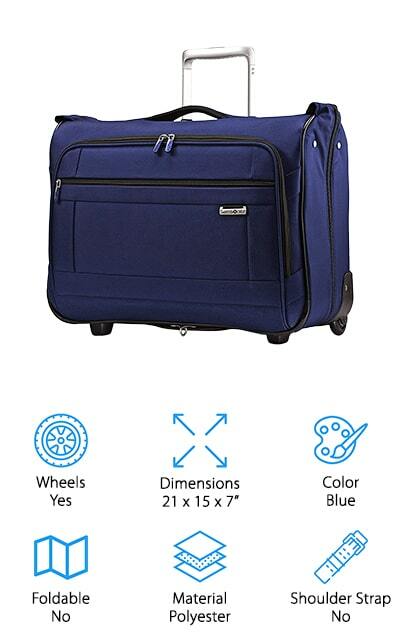 This inexpensive bag fits in an overhead bin and it’s actually lightweight enough that you can fold it down smaller to fit into a standard suitcase. No matter what you’re looking for when it comes to packing you can get it with a simple design.